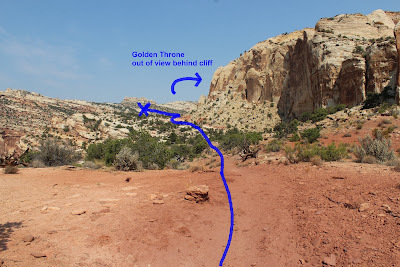 The Golden Throne trail is located in Capitol Reef National Park. The trail begins in the belly of Capitol Gorge and climbs the cliffs gaining over 700 feet of elevation to an area 2 miles from the trailhead beneath the Golden Throne where there are good panoramic views of the surrounding area. Just the drive up Capitol Gorge to the trailhead is a treat in and of itself as the dirt road passes through narrow canyon walls that tower high above. 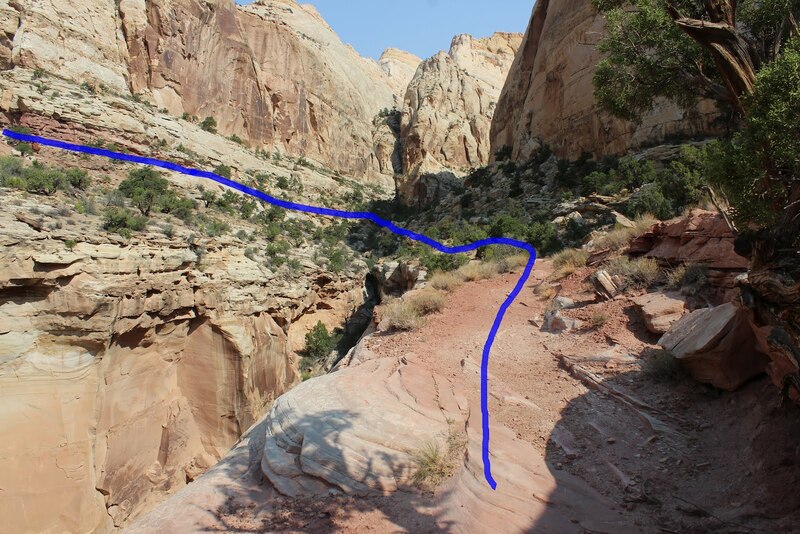 The Capitol Gorge road that leads to the trailhead is a dirt road with a distance of 2 miles. The road is well maintained but may be closed when threatening thunderstorms are in the area. All of the rain that falls in the cliffs above the gorge quickly finds its way down the steep canyon walls creating epic fast moving flash floods. The sign at the trailhead shows an expected elevation gain of 1100 feet. The trails map for Capitol Reef indicates an elevation gain of only 730 feet which is closer to what our GPS measurements came out to be. The trail does climb continually from the trailhead to the view point at the base of Golden Throne but it does so at mostly a moderate pace. 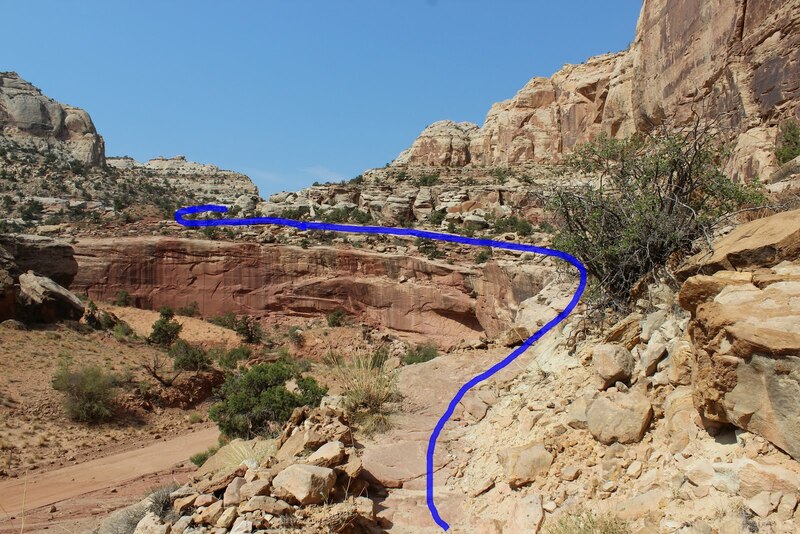 The amount of elevation gain coupled with the overall distance makes this a strenuous hike but not quite as much as many of the other hikes in Capitol Reef National Park. The trail departs from the trailhead and climbs back along the road coming into Capitol Gorge. If you look up at the rim above the road as you drive in you might notice other hikers that have already set out upon the trail. 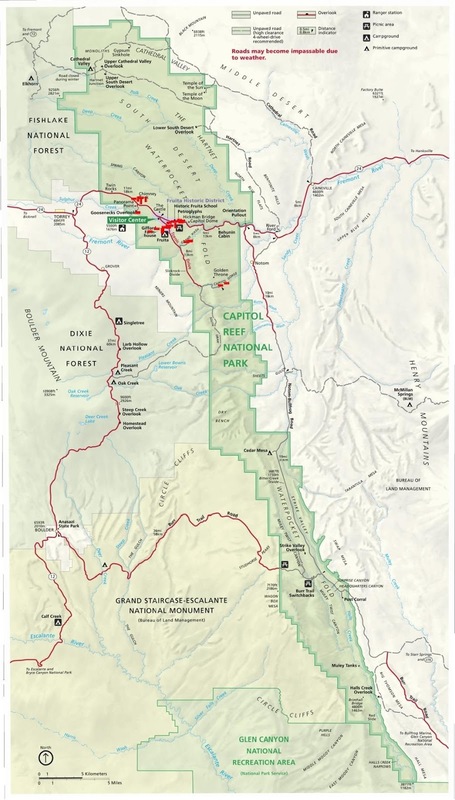 There are 2 trails that depart from the Capitol Gorge trailhead so just because there are quite a few vehicles in the parking area doesn't mean that you will be running into a crowd while you are hiking. As the trail wraps around each point in the cliff it heads inward into each side canyon giving the impression that you are about to begin hiking to some point through the cliffs. But as the trail comes near to the cliffs in the back of the side canyon the canyon becomes shallower until the canyon floor comes up to meet the trail and the trail crosses over to the opposite side of the canyon and heads back out towards Capitol Gorge. Each time the trail turns back heading out of the side canyon toward Capitol Gorge it begins gaining a little more elevation. As you hike into each side canyon you are treated with new views of canyon walls and as you had back out the knobs and points to the south of Capitol Gorge are laid out before you. One mile into the hike, at the halfway spot, the trail travels around one of the points of cliff and the first glimpse of Golden Throne comes into view. Each side canyon is a little different from the one before. The variations of scenery give the trail a pleasant feeling of adventure. The trail straightens out somewhat over the last half mile. The Golden Throne disappears again behind the closer cliffs. The trail ends on a small hill where you can turn and view the west side of Golden Throne. The prominence gets its name because the Navajo sandstone structure that would otherwise be creamy white has been stained by the minerals in the overlying cap rock of Carmel sandstone. A stroll over to the rim of the canyon to the west reveals that the hike has brought you almost out to the beginning of Capitol Gorge where the dirt road departs from the pavement. The hike back to the trailhead is pretty much all downhill. There are a few bighorn sheep in the area so you might keep your eye out for them. Bighorn like to browse on the tender leaves from the bushes. On really hot days they can sometimes be spotted laying in the shade and during cold weather they might be found basking in the sunshine. Check out the post for the Cahob Canyon hike, when it becomes available, for some pictures of some Capitol Reef bighorns. Most of the hikes in Capitol Reef involve a good bit of elevation gain. The Golden Throne trail has more gradual sections of climbing that make it a little easier than a few of the other hikes that are listed as strenuous. Sandstone cliffs, especially the ones with a dark patina, can absorb a significant amount of heat from the sun. That makes them great to hike around in cooler weather but in mid summer they can make you feel like you are in a frying pan. Early morning is often the best time of the day for enjoying the strenuous hikes of Capitol Reef. You might find the view of Golden Throne a little anticlimactic when you reach the end of the trail but everything along the way should satisfy your appetite for pleasing scenery as well as the feeling of accomplishment for having gone the distance. If you would like to see it for yourself then all you have to do is 'Take a hike'.